The rise and rise of Chvrches has been remarkable. Founded just two years ago in 2011, everything has happened so quickly for Lauren Mayberry, Ian Cook and Martin Doherty. They’ve spent the last two years touring the world. So far, Chvrches unique brand of shimmering electro-pop has conquered Britain, Europe, Japan, Canada and America. Somehow, Chvrches have also found the time to release four singles and a trio of E.Ps, including the recently released Gun E.P. These singles are a tantalizing taste of the main event, Chvrches highly anticipated debut album The Bones Of What You Believe, which will be released on the 23rd September 2013 on Virgin. In some ways, Chvrches lead vocalist and keyboard player, Lauren Mayberry is an accidental pop star. She originally studied law and after graduating, studied journalism. With a Masters in journalism on her C.V. Lauren became a freelance journalist. From there, she almost inadvertently, became a musician. Like many Scottish children, she learnt to play the piano as a child. It’s almost a rite of passage. Then when she was a teenager, Lauren learnt to play the drums. Drums or piano, it’s no contest. Soon, she was playing drums for various bands. Between the ages of fifteen and twenty-two, Lauren played in two bands. In Boyfriend/Girlfriend she was the drummer. Then when Lauren joined Blue Sky Archives, she played keyboards and drums. It was in Blue Sky Archives, that Lauren met Ian Cook. Blue Sky Archives were recording an E.P. and the producer was Ian Cook. He’d originally been a member of Aerogramme and The Unwinding Hours. Ian also wrote music for television and film. Production was another thing he enjoyed. Through producing Blue Sky Archives, Ian met Lauren. She proved to be just who he was looking for. Ian Cook and Martin Doherty, who was a member of The Twilight Sad when they played live, were working on a new project. They needed someone to lay down some vocals. Neither Ian nor Martin saw themselves as lead vocalists. So, Lauren was asked to come along and sing on a demo. Little did Lauren realize what she’d let herself in for. Ian and Martin it seems, are perfectionists. That proved to be no bad thing. They spent eight months in a basement studio, working on their new project. Eventually, it was finished. It had been such a success, they decided to transform this studio project into a live band, that became Chvrches. May 2012, saw Chvrches release their first single. They did this in an unusual way. Through the blog of the Neon Gold label, people were able to download a free copy of Lies, their debut single. This somewhat unorthodox release must have worked. Soon, people were talking about Chvrches, including the Guardian, who got in on the act. Rather pompously, in June 2012, they hailed Chvrches as one of their bands of the day. At least people were taking notice of Chvrches. By now momentum was building. What helped, was that Chvrches were a great live band. Throughout the summer of 2012, were honing their live act. Quickly, word was spreading about this new Glasgow band. September 2012 it seemed, was the right time to release their sophomore single. The Mother We Share was released in September 2012. In between touring, Chvrches found two days to write and record their new single. On its release, it was well received by critics. They were falling over themselves to heap praise on Glasgow’s newest band. A classy and classic slice of glistening, ethereal electro-pop, Chvrches had made an impression. At the end of 2012, when various magazines and radio stations published their best of 2012 polls, Chvrches name loomed large. The NME, BBC and Huffington Post praised Lies and The Mother We Share. This new band had made a big impression. Would 2013 be as big a year for Chvrches? Looking at Chvrches achievements so far, I’d suggest that they’ve surpassed everything they achieved during 2012. They’ve released two single and two E.P.s, recorded their debut album and continued their never ending tour. 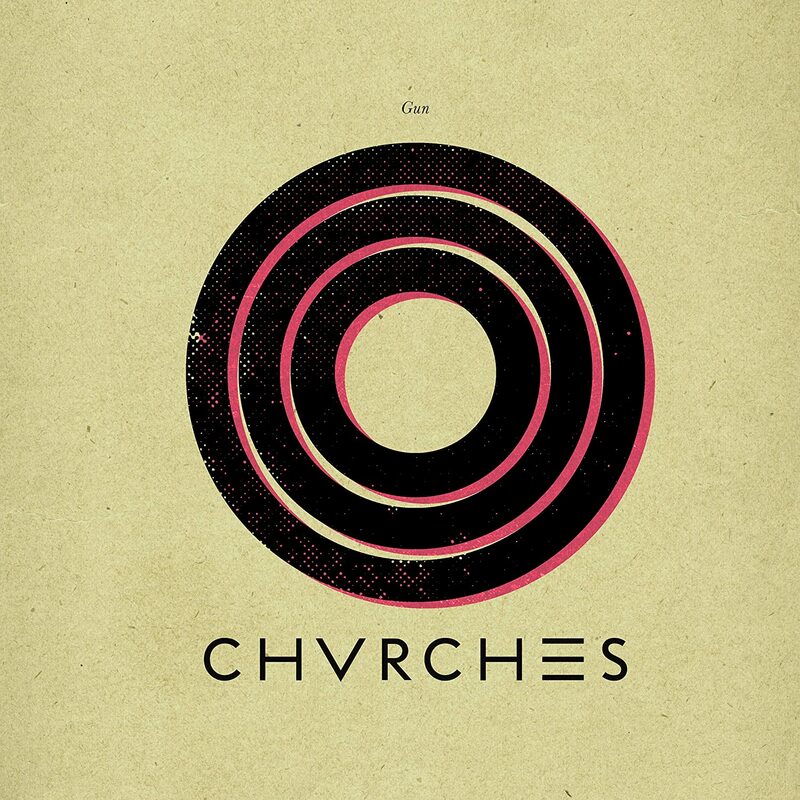 July 2013 saw Chvrches released their fourth single Gun. Just like Recover, Gun was available as either a single or an E.P. It’s the E.P. I’ll review. Gun gave Chvrches the biggest single of their nascent career. Not only did it reach number fifty-five in the UK, but number forty-four in Japan. It seemed that with each single, Chvrches were conquering another part of the world. Britain first, then Europe, Canada, America and now Japan are all devotees of Chvrches. So will you, once you’ve read about their sophomore E.P. Gun. The Gun E.P. opens with the title-track Gun. From the opening bars, my faith in modern music is restored. It’s a reminder of what a classic pop song sounds like. Stabs of keyboards are joined by shimmering, synths. They provide the backdrop to the ethereal beauty of Lauren’s emotive vocal. Accompanying her heartfelt vocal are rolls of drums, breathy harmonies and washes of crystalline synths. As for the back synth and drums they add duel bursts of drama. Their raison d’etre is to reinforce the drama and emotion in Lauren’s vocal. Dance-floor friendly, Gun is full of sweet poppy hooks and moments of drama and emotion. It’s the perfect introduction to Chvrches, and should whet you appetite for their forthcoming album The Bones Of What You Believe. As for the other three remixes of Gun, they each bring something new to the original. The four remixes are very different and introduce four talented remixers. First up is Jamie Isaac’s wonderfully atmospheric and wistful remix. Slow and dubby, its dreamy sound is gorgeous. Quite simply, this is the best of the four remixes. The Auntie Flo remix has a spacious, melodic sound. Just a Fender Rhodes and percussion accompany Lauren’s soul-baring vocal. Gradually, the song reveals its secrets. Thunderous drums are dropped in joining stabs of synths and tortured harmonies. With its much more dance-floor friendly sound, it shows the different way remixers approach the same song. Next up is the Groundislava remix of Gun. Straight away, it’s designed for the dance-floor. Here, the remixer takes Lauren’s ethereal vocal and adds filters. They take on a cartoon quality. That seems strange. After all, the vocal makes the track? He does the same with the backing vocals. They take on an eerie sound. Pounding, galloping drums, washes of synths and percussion adds to the drama of this remix which is very different to its predecessors..
DJ Helix is the last remixer to get his hands on the track. From the get go tribal drums join brash synths. The drums are like a call to dance. In between the drums and synths, is Lauren’s vocal. Its ethereal beauty is a contrast to the power, drama and brashness of DJ Helix’s imaginative arrangement. So that’s the story of Chvrches’ Gun E.P. Obviously, the original is the best. Gun features Chvrches at their best, fusing musical genres and influences seamlessly. A fusion of pop, synth pop, electro-pop, house and Euro Disco, Gun is the best single Chvrches have released so far. It’s then remixed by four remixers. Each brings something new and innovative to the track. Gun is taken in ways that I’m sure even Chvrches never imagined. The best is the dreamy, dubby, Prozac sound of Jamie Isaac’s remix. After that, I favor Auntie Flo’s remix. It’ll keep any dance-floor packed. The other three tracks all offer something imaginative, inventive and innovative. It never ceases to amaze me how remixers can produce something new and vibrant from the same stems. To be able to do that, they deserve the utmost credit. It’s good to hear a new breed of remixers getting the opportunity to remix high profile tracks. For me, it makes a change from the same old faces producing the same predictable remixes. This new breed of gunslingers who remixed Gun, are the future of remixing. As for Chvrches, they’re the future of Scottish music. Released in July 2013, Gun is a tantalizing taste of what we can expect from their debut album The Bones Of What You Believe, which will be released on Virgin on 23rd September 2013. I’m sure The Bones Of What You Believe will feature innovative, inventive music. It’ll be pioneering electro-pop, full of shimmering synths and the ethereal beauty of Lauren Mayberry’s vocal. Along with Ian Cook and Martin Doherty, the other to members of Chvrches, they look like being the next big band in Scottish music. Many have been contenders for the title, now it looks like Chvrches with their unique sound, will claim it as their own. Chvrches have restored my faith in modern music. I’m pleased that there’s still group’s capable of making the perfect pop song. That’s what Gun is. It’s a reminder of what a classic pop song sounds. For everyone who says pop music is dead, play them Gun. That’ll prove them wrong. Pop music is alive and kicking, and Chvrches are the future. ← THE BUDDY COLLETTE QUINTET-BUDDY’S BEAT.